Since the beginning of the year 2016, the LA Referencia network has been implementing the OpenAIRE guidelines enabling open access repository networks to expose their content in a common format and consequently to ensure more seamless integration of different open access repositories. OpenAIRE and LA Referencia are the two largest and most well-developed regional repository networks, representing about half of the world’s open access (OA) repositories. The OpenAIRE portal now includes almost 14 million OA publications and 16,800 datasets from almost 700 OpenAIRE compatible data providers. LA Referencia represents the network of OA repositories from nine Latin American countries. It supports national OA strategies through shared standards and a single discovery platform harvesting scholarly articles, theses and dissertations from national nodes, which, in turn, harvest from repositories at universities and research institutions. OpenAIRE guidelines (meeting the Horizon 2020 OA requirements) define standardized metadata elements and vocabularies for OA repositories, thus helping repository managers expose publications, datasets and CRIS metadata via the OAI-PMH protocol in order to integrate with OpenAIRE infrastructure. 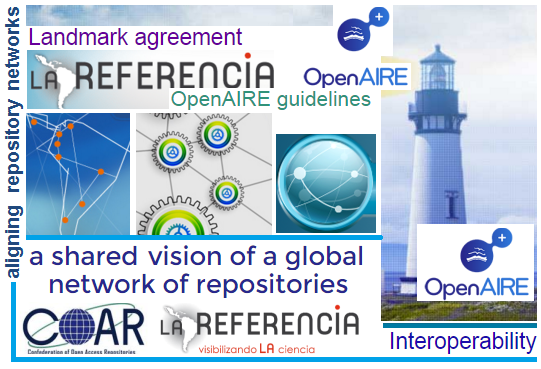 Since the beginning of the year 2016 - after the signing of the landmark agreement between OpenAIRE and LA Referencia - the LA Referencia network has been implementing the OpenAIRE guidelines enabling OA repository networks to expose their content in a common format and consequently to ensure more seamless integration of different OA repositories. It’s worth mentioning that Latin America is one of the world’s most progressive regions in terms of OA. In this context, there are three countries that have passed national OA laws (Argentina, Peru and Mexico) and several other countries that are pursuing legislation as the basis for any citizen to get free access to the scientific and academic production financed partially or totally by public funds. To demonstrate their commitment towards international interoperability, the Mexican government’s science and technology agency, CONACYT (also a COAR member) published a set of Technical Guidelines for the National Repository and Institutional Repositories (2015) for all Mexican repositories which include the adoption of the OpenAIRE guidelines (for Literature Repositories V 3.0 and for Data Archives 2.0). The ‘Technical Guidelines for the National Repository and Institutional Repositories’ aim to establish mechanisms and actions to be taken for the preservation (see: DINI Certificate) of academic, scientific, technologic and innovation heritage, that comply the process of peer review; as well as its relevant primary data. Since January 18, 2016, competitive funds through CONACYT Institutional Fund (Foins) to support the development of institutional repositories have been opened (see: press release). The call consider three alternatives: creation, development and consolidation of institutional repositories in accordance with the above mentioned Technical Guidelines. Last but not least. OpenAIRE - in collaboration with the Confederation of Open Access Repositories COAR (see: COAR Roadmap: Future Directions for Repository Interoperability) – is continuing to align repository infrastructures internationally, with the main aim to bring interoperability to the world’s repository infrastructure. If all repositories expose their metadata in a uniform way, this will significantly aid the interoperability of the contents of repositories and enable greater discovery and re-usability of research contents on a global level. Under the auspices of COAR, LA Referencia, and OpenAIRE will continue to work with other national and regional networks to promote the vision of a global repository network and investigate common services in support of OA and open science. Landmark agreement between OpenAIRE and LA Referencia on repository aligning (COAR, 2016). Promotional Workshop/Consultation for Latin-American region (report, 2015). Recommendations for the transition to Open Access (Austria’s Way to Open Access, 2016). Open Science days at the Max Planck Digital Library (2016). LA Referencia, OpenAIRE and COAR reaffirm their commitment to a shared vision (2015). Síntesis Reglas de Metadatos LA-Referencia (2015). Policy Framework and Roadmap for Open Access, Open Research Data and Open Science (2014).